'Child Marriage' we mean a marriage where either of the contracting parties is a child. 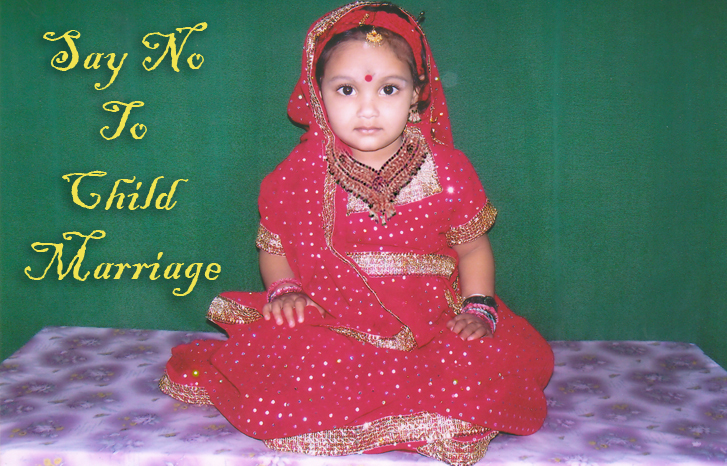 Ordinarily in such marriages either both the bride and bridegroom may be children or one of the parties is a child. For the purpose of marriage, a male person below the age of twenty one years and a female below the age of eighteen are considered to be children. Although there are difference of opinions and no uniform legislation regarding the age of a child, but one thing is clear and certain that for the purpose of marriage, the boy should have attained the age of majority i.e. he should be at least twenty one years of age and the girl should not be less than eighteen years of age. Almost all the religions and personal laws are unanimous in this respect. Hindu Marriage Act 1955 regulates the marriage among Hindus and according to this law a valid marriage between two Hindus can take place where the bridegroom has completed the age of twenty one years and the bride has completed the age of eighteen years apart from other condition as provided under the law. The Special Marriage Act, 1954 also prescribes the age of twenty one and eighteen for males and females respectively for the purpose of marriage. Any marriage solemnised in contravention of the age requirement will be null and void and can be nullified by the court. There are several reasons for continuance of such a practice but poverty is regarded as the most important one. The age old tradition and certain prevailing social customs are also responsible for the same. Simultaneously, the poor families due to their economic burden also want o get their child marry at an early age so as to relieve them from further burden. Thus the economically weaker sections mainly resort to this practice. But still in western parts of the country this practice is also prevalent among well to do families. Recently, the National Plan of Action for Children, 2005 has been introduced to provide a road map for steps to be taken for improvement in the lives of Indian Children. Among several measures the Plan of Action set the ambitious goal of eliminating child marriage completely by the end of 2010. The plan is certainly ambitious and action is still a question mark as the year 2010 has come to an end. The latest report of the Unicef, the State of the World's Children, 2009 says that 47% of India's women aged 20-24 years were married before the large age of 18, with 56 percent in rural areas. The report also showed that 40 percent of the world's marriages occur in India. Such a revelation certainly is not encouraging.